Piles of thick books with key texts in world philosophical thought, numerous handouts with colorful underscores, essay drafts and Berlin event guides are a common decoration of the ECLA of Bard student’s writing desk. Since our education requires reading numerous primary sources and extensive writing, one may hear I have so much reading to do/essays to write in the cafeteria on a daily basis. However, ECLA also gives students a chance to develop their craft skills, through the art workshops it offers every term. After successfully concluding last semester with the final theater presentations in the basement of Platanenstr. 98, our theatre and installation professor David Levine passed the baton to newly arrived John Kleckner, who taught this term Fundamentals of Drawing and Collage in the “art garages” of the same building. Exercising the right hemisphere of the brain, students of various art backgrounds observe a simple and important truth: no matter what you’ve heard during the drawing classes in secondary school, everyone can draw. The course was originally designed for absolute beginners, though some students of the Drawing and Collage class have an artistic background. When I made a syllabus for this class I was aware of a certain kind of shared trauma from past common experiences, says John. Many people have a firm conviction that they cannot draw, but art is a subjective thing, and no one can say for sure that realism is better than abstract cubism. There are many examples of persons who could never draw realistic still life in their childhood, but later became conceptual or performance artists. Together with my art friends we share anecdotes about successful artists who had the terrible experience of their first crayon painting being criticized or who have been rejected from art schools. Here I try to create a nurturing and cultivating environment, as at this stage of learning there is no need for negative critiquing and pointing out mistakes, but rather for finding a way to help students create what they have in mind using various tools, adds the professor. 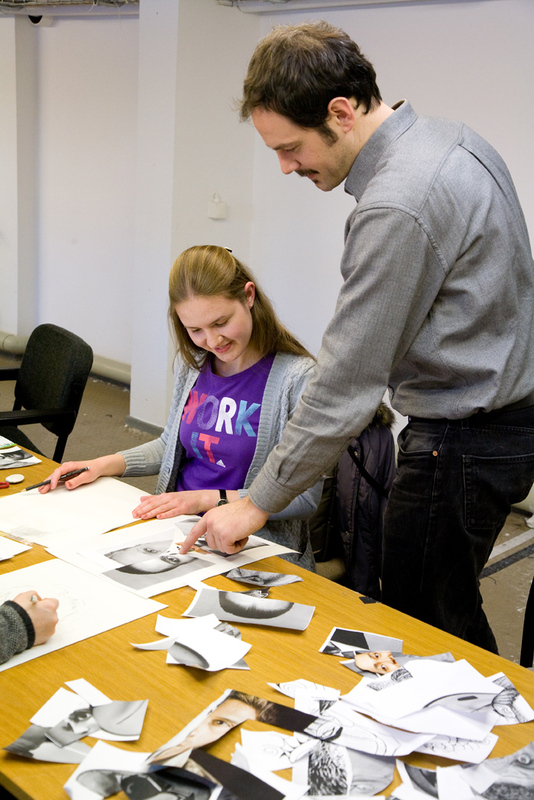 Offered for the spring semester 2013, Fundamentals of Drawing and Collage is an introductory survey within which students are supposed to try as many new styles and techniques as possible. For the first part of the term, students experimented with sketching, shaping and shadowing, blind and memory drawing, fundamentals of perspective, composition and proportion, creativity development. Of course I could teach a course only in drawing faces so by the end of the term every student would be able to draw a proper face, but my task is to help students have a peek at different things and start going further in their preferred direction. No one expects that a graduate of this class can immediately have a solo show in the Berlinische Galerie – same as in language learning, this journey takes time, but with efforts and discipline it’s always possible to succeed, encourages John. Another important part of artistic education is stretching the borders of comfort zone. For those who usually draw with pencils, Kleckner suggests trying charcoal or using multiple pencils at once to see what happens. Holding art supplies with a different hand, drawing with erasers, altering size and scale – all kinds of experiments help the aspiring artist find his or her unique style. To give an idea of the changing currents of contemporary art, John prepares slideshow presentations of works of conceptual artists, painters, collagists, and representatives of the Berlin Dada movement. He also organizes trips to museums and galleries. Every class ends with an improvised student gallery, where everyone can look at their peers’ work and take note of some tricks. John admits that students’ works are often so original and surprising, that he learns something for himself. After graduating from the University of Iowa, John Kleckner worked in two art capitals of the United States – Los Angeles and New York – for a few years. In 2007 he arrived in Berlin for an exhibition and, liking the atmosphere and company, decided to stay a bit longer than planned. One month turned into half a year, then another year and so on, until he became a Berlin-based artist. John compares the Berlin art community to Los Angeles in its freedom from any pressure and in its friendly attitude: While in New York artists are guided by the principle “I’ll make it to the top first and then will help you,” in Berlin and Los Angeles it’s more like: “let’s get there together.” The change of scene prompted a change in John’s artistic style. A few years ago, he was fond of Northern European Renaissance art and historical art, but in Berlin he found more friends in the contemporary art field, and that somehow influenced what he is currently doing. Of course there is always a contrarian of general artistic sensibility – if I see too much of one thing, it’s likely that I will create something else, but in general there are less and less schools and artistic movements, rather a bunch of people who are each working in their unique style. The artistic lifestyle is surrounded by clichés – endless parties, clubbing, hangovers, sleeping all day and working when inspired. In reality, this way of life is only possible for those who consider art a pleasant hobby. Artists who intend to live off their work spend hours in the studio and attend openings a couple of times per week or month. As a student, one always has someone who forces you to come to class and sets the deadlines. But turning art into a business requires a high level of self-discipline and responsibility. When not teaching at ECLA of Bard, John starts his studio day around 9.00-10.00 in the morning and stays there until 17.00–19.00 or even longer if there is a planned exhibition or an upcoming deadline. Of course it’s also necessary to consider times of productivity and periods of artist’s block. Sometimes the artwork requires a few hours of painting with the brush on canvas, yet weeks and months of preliminary thought on the concept. In general, the difference between the small self-run enterprises and the self-employed artist is that a small enterprise may close if it is not profitable, while a true artist can always find alternative sources of income in order to keep creating. While Hamburger Bahnhof and the Berlinische Galerie are the prominent places to experience contemporary art in Berlin, there are hundreds of galleries which are not that well-known. Compared to numerous other ephemeral galleries, the independent exhibition space Autocenter is a real “dinosaur” of contemporary art in Berlin. It was founded by the artists Maik Schierloh and Joep van Liefland in an auto parts store as a non-profit art space more than 11 years ago. Another favourite place of John’s is Soy Capitán – a gallery space in Kreuzberg founded by Heike Tosun. For those who can keep up with a long night, John recommends the program Videoart at Midnight in Babylon Cinema. One can feel overwhelmed by the Berlin art world – sometimes it’s really hard to choose where to go out of hundreds of email invitations. Even though the ECLA of Bard campus is located in a quiet place and may seem far from the heart of the city, Berlin is still right there with its tempting artistic life in full swing – one just needs to hop on a tram to experience it all.